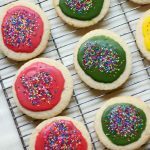 Gluten-Free & Vegan Cut-Out Sugar Cookies that taste exactly like the sweet, buttery, tender delights from your favorite childhood recipe! With a simple sugar-free and natural colored icing, these top-8 allergy-free treats are perfect for any holiday, party, or celebration! Easy to make and fun to decorate! Nostalgia at it’s finest! It had been SO long, so very long since a classic decorated cut-out sugar cookie graced my kitchen (and mouth). I just couldn’t go another holiday season without some sugar cookies, and word on the street was, you couldn’t either! Again, that’s kind of a lie though, since I can’t recall many times I ever made and decorated sugar cookies for Christmas or any holiday. Those sad childhood confessions that I only feel left out about now when I require all the dietary modifications! I made these “evergreen”, so I didn’t use any holiday shaped cutters or decorations, because cut-out sugar cookies aren’t ONLY for the holidays, y’all! BUT, it is prime cookie baking, decorating, and consuming time. I already have a request put in by the family to make another batch to enjoy during or Christmas Eve/Christmas festivities. I’ll probably break out the snowman and stocking cookie cutters for that batch! The thing about cut-out sugar cookies is that the dough needs to be durable enough to actually roll and cut out, but still be slightly soft, tender, sweet, and o so buttery. There are the super fluffy, cakey, lofthouse-style sugar cookies with buttercream frosting, but that’s not the classic cut-out with royal icing that we use during the holidays! All delicious and boy, do I wish I’d had more sugar cookies in my life! I actually never cared for sugar cookies as a kid. If they were decked out and decorated, maybe, but a plain sugar cookie? Blech, give me the chocolate chips please! Like most of these classic recipes, tastebuds and cravings change and the sugar cookie need was REAL! 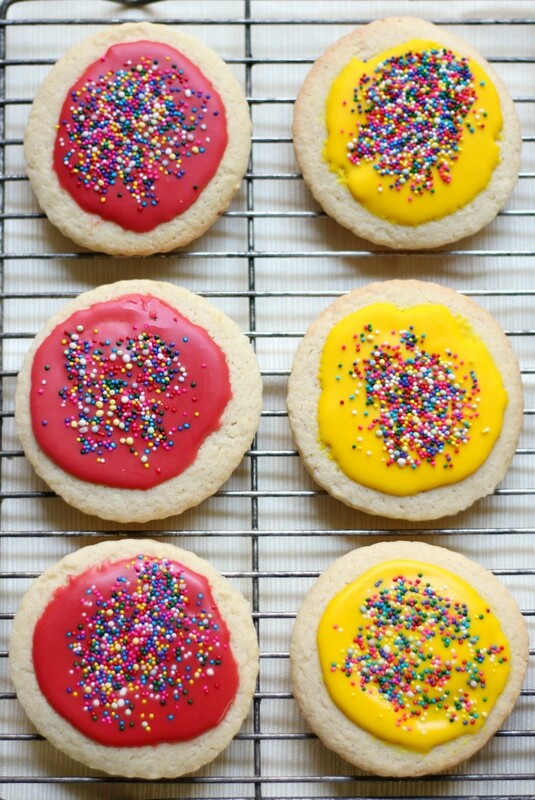 Of course, some non-traditional sugar cookies have graced this blog before, but not the same! 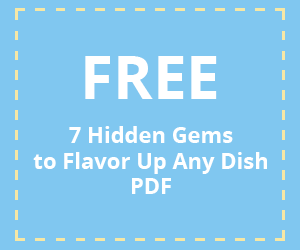 The real deal, simple and easy, fun for kids and families (and college kids), but with the trickery of being gluten-free and free-from needed to happen! In a large mixing bowl, combine all the cookie ingredients, mix and knead to combine. Form the dough into a large ball and place in the fridge for 30 minutes to chill. Once chilled, roll the cookie dough out between 2 Silpats or parchment paper, to about 1/4-inch thickness. Use cookie cutters to cut out the shapes of your cookies (amount will vary depending on your cookie cutters). Re-roll the dough as needed to finish cutting as many cookies as possible. Place the cut-out cookies (transferred with a spatula), evenly spaced out, on a baking sheet lined with a Silpat or parchment paper and bake in the oven for about 14 minutes until slightly golden brown around the edges. 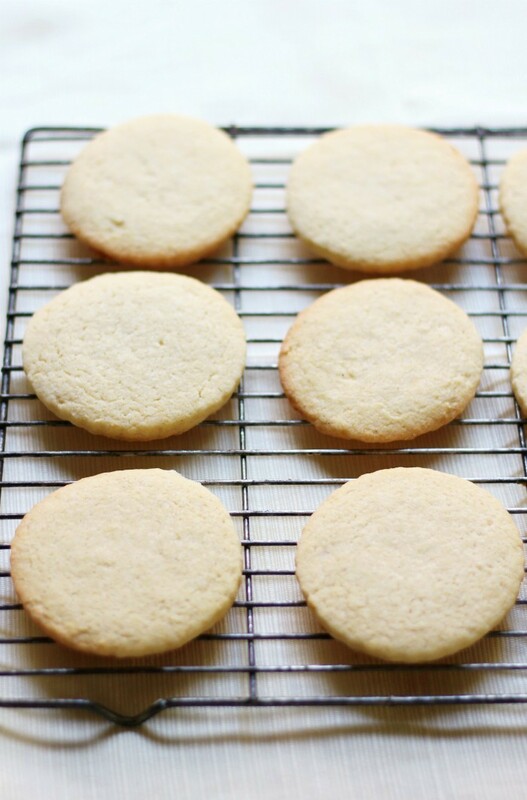 Allow the cookies to cool a bit before transferring them to completely cool on a wire rack. To make the icing, in small bowls combine the ratio of powdered sugar, milk, and food coloring for as many different colors as you’d like, and mix well. 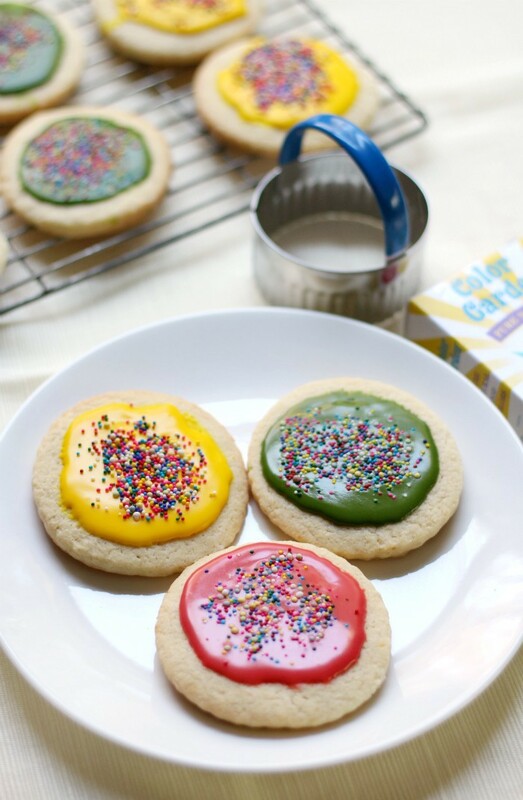 Then take a spoon to ice the cookies and decorate with sprinkles or any other decorations you’d like! 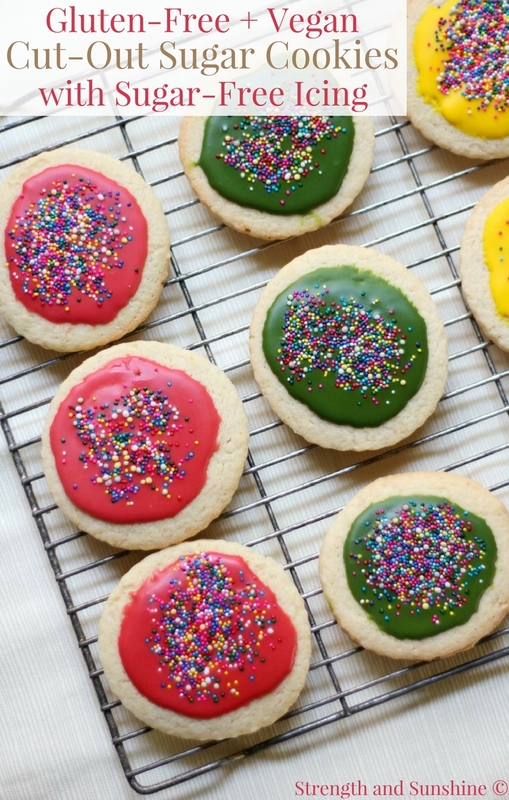 + Were cut-out sugar cookies and decorating them a holiday tradition for you (or still is)? I wish (but at least it can be now)! When you use the Ener-G egg replacer are you meaning 1.5 tsp prepared with the water like it says on the box? Or are you just adding the powder to the other ingredients? I believe I just threw it in. looks so good. next year I’m going vegan for sure. It doesn’t matter what your diet is, you can always make these cookies. 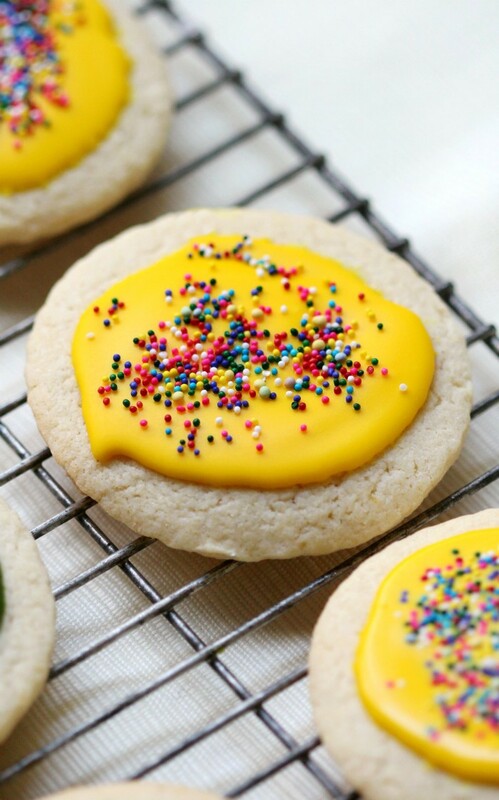 Love these cookie pretty and such fun for the whole family to enjoy! these look so yummy and I love that they are vegan! Yess!! the hunt is over. I wanted to bake with my son today but had struggled to find a healthy recipe! Thank you. Now to get my bake on! These are still cookies, but a delicious recipe non the less! Where would I find Powdered Erythritol? Do you think a locally owned health food store have it? You can order it online. That’s how I get it. Or…just use your preferred powdered sugar. Thank you. I’ll look online. We live in a rural area so we have to order a lot of things that aren’t available here. Can’t handle powdered sugar. I’ve stopped icing anything. Thought I might try your recipe. The perfect Christmas cookie! As someone with many dietary restrictions this is perfect so I can still enjoy the sweet things this time of year. Lovely photos, I really liked all the different colour icings. Great post! Thank you! Everyone deserves to have a safe treat during the holidays! Oooo these look so yummy! I’m gonna be making them to bring home for Christmas! These look great! Just what I was looking for! 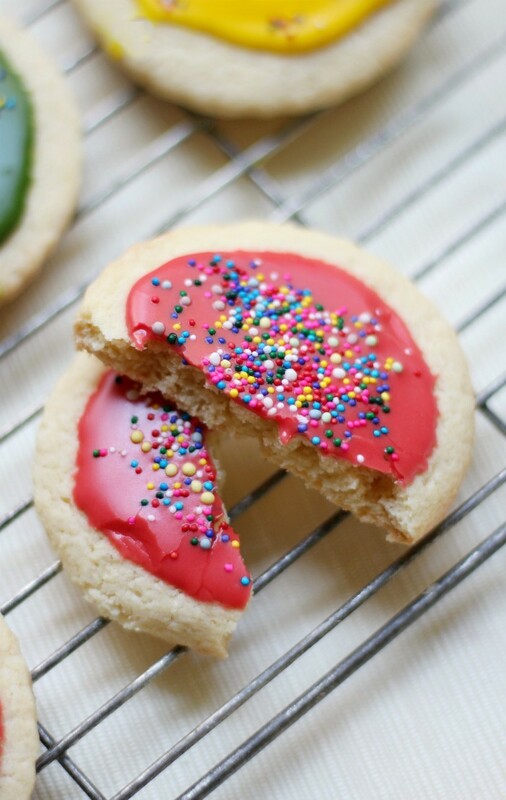 These sugar cookies look amazing!! How cute! and I’m sure they taste delicious too! If they didn’t taste good I wouldn’t be posting the recipe, now would I? These are so fun and colorful! These are lovely!!! So pretty and cheerful! These are so cute! I love that they’re allergy friendly and sugar-free too! Thanks for the recipe. The cookies look amazing! Gotta try this out! These look amazing and I’m so excited to try this recipe (pinning for later!). I am allergic to eggs so I love this alternative. These are just what you need! These would have gone down so well at the bake sale we had here at work last Friday! They could have made you millions $$$$ 😉 Haha! Oooo! I am definitely making these for the holidays. You always have the best vegan cookie recipes! Thank you! Everyone should be able to have a good cookie! These look and sound amazing! Love that they’re suitable for such a variety of diets too. 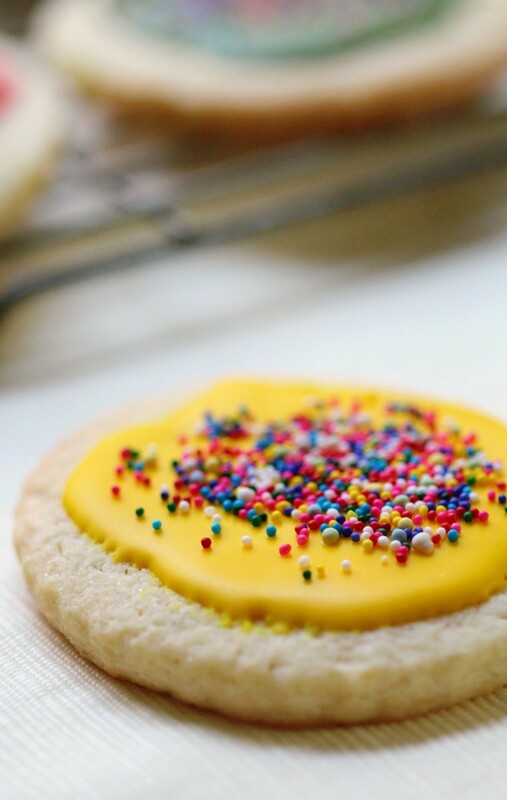 Everyone needs a good sugar cookie! These look awesome! I am so looking forward to making sugar cookies this year. They should be a tradition! These would make a great treat for anyone, but I know a diabetic who would really appreciate a few cookies. These look and sound so delicious yumm!!! 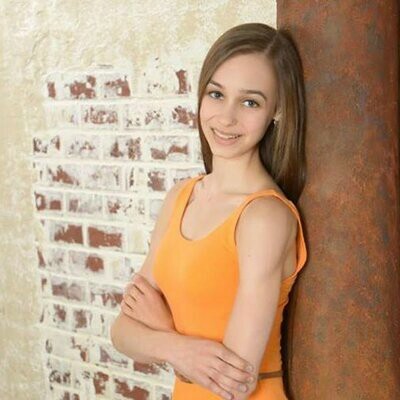 WOW – love the GF and Vegan and it’s so vibrant and beautiful as well. Pinned and will tweet as well. Thanks! Don’t copy the recipe now! These look delicious. Love the decoration too … want to get into the screen and grab one. Love it! Your recipe seems so easy and the cookies look absolutely delicious! Plus I also love your photos. I pinned your recipe for later cause I have to try making them some day. Thank you! They are super easy to make! These look so fun! I love how you got your icing colors to be so bright! I was impressed by the Color Garden dyes!